Entrance Antiphon: After the Lord was baptised, the heavens were opened and the spirit descended upon him like a dove, and the voice of the Father thundered: "This is my beloved son, with whom I am well pleased"
The Baptism of Christ 1450 by Piero della Fransceca 168cm x 116cm, National Gallery, London. 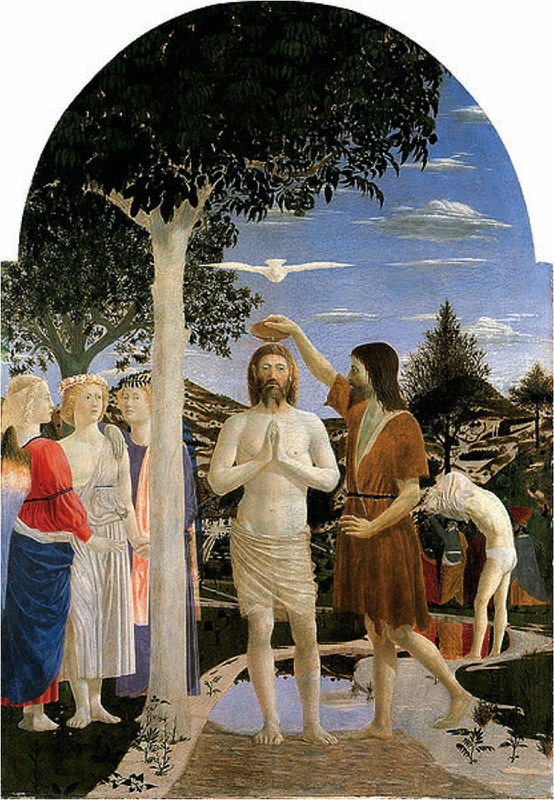 Piero's mastery of mathematics and perspective present us with a very staged and symbolic account of Christ's baptism. The trees, figurative groups and the river, intensify the very moment when Christ is baptised and the image of the Holy Spirit hovers directly above Christ as the water is poured over his head.